Various presenters gave the audience informational talks titled Plein Air history, Using Watercolor Outdoors, including oil paint, atmospheric perspective and packing lightly. Joyce Cromwell brought in a bit of this and some of that and explained options that people have when starting out. It is so difficult to get started outdoors when it comes time to pack-most of us want to have everything in our studies available and with us. Paulette's complementary color schemes are used to show different effects in her talk "Painting the Light." 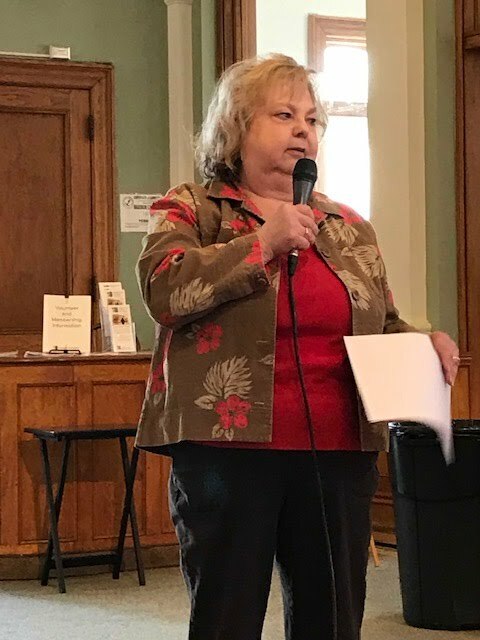 Donna Hale graciously emceed, giving an introduction about Plein Air as well as introducing each presentation and leading a lively question and answer session. Two years ago we held a plein air workshop for potential painters. Not only was it well received and attended, but we also had requests to have another one. 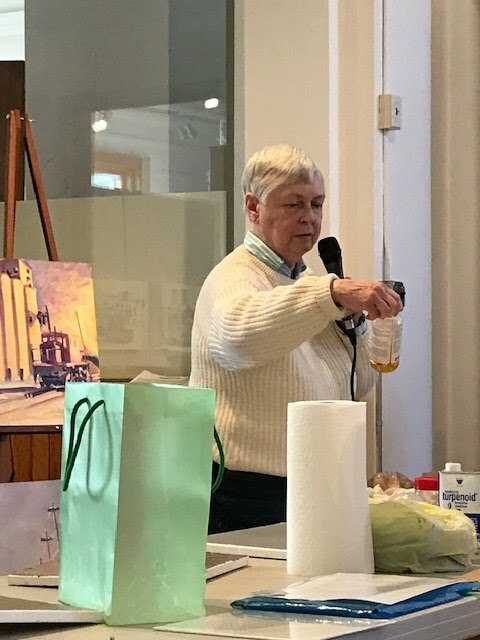 On Saturday, April 6 the Carnegie Art Center hosted this workshop. 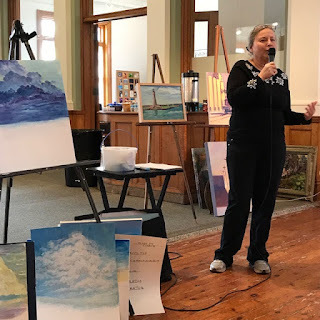 Paulette gave an exciting overview of clouds, their height and shape, how to place them on her canvas and also did a demonstration of painting clouds. Paulette Arida Jurek brought a large number of paintings to demonstrate some different ways an artist chooses to portray light in a landscape. Our painters have scheduled many upcoming paintouts from March to October already, but missed the friendships created over the years in nicer weather. It’s been a cold windy winter for painting outdoors. Now an annual tradition, we had our 'winter salon' with Sherrill Primo which included a pot luck lunch. We had all sorts of visual stimulation from Diane Goupil's mother's historic paintings of mid century Grand Island to hand made paper scenes. 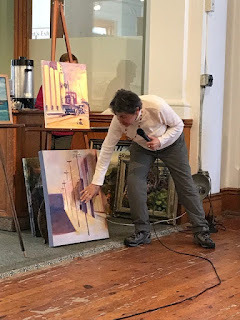 Painting problems were solved, suggestions noted and we got to see a lot of new work from the crowd that participated. Donna Hale's completed Snowball bouquet painting started a conversation....was it finished, did it need more red, how come the flowers look 3-d, and why was there a cover sheet over the pastel. It’s always nice to have a chance catch up and to talk about art for a longer time than our lunchtime critiques on the road. Carnegie Art Center was abuzz with artistry, guests and more people who came for the art at the Thursday evening NFPAP reception. There were times that it was hard to see the art! What are the red dots for, I overheard, why those dots mean SOLD! The show was extended, but comes down November 10, so hurry in. A short film, prepared for the Carnegie Art Center Exhibit, October-November, 2018 by Kath Schifano-her first movie attempt!